I’ve posted extensively on a book by Charles Murray – “The Bell Curve”. I bought the book and set it i my stack – forgotten for many many months. Then I heard someone quote “Coming Apart”, bought it and remembered that I had “The Bell Curve”. I read it without being aware of the controversy. Then I hit the chapter that created the stir. I remember thinking then that the book could have stood alone without the work on race; IQ and its impact on life outcomes is fascinating enough without adding the very difficult conversation regarding race. Anyway, Mr. Murray received such grief for “The Bell Curve” that when he wrote “Coming Apart” he focused only on white analysis. While I’m not going to do a chapter by chapter breakdown this time, I am going to post insights that I find interesting. Starting with a 25 question survey. Mr. Murray included it in the book to provide insight to the likely audience of the book and how far removed they are from “the rest of America”. Take the test. And report your scores in the comments. I CAN NOT FATHOM a family that would score 2 on that test. Can not do it. 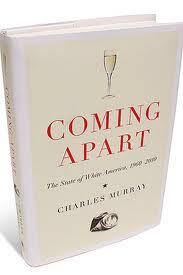 This entry was posted in Life, Politics: National and tagged Charles Murray, Coming Apart, The Bell Curve. Bookmark the permalink.